Government assists a financial establishment of indoor smoking room. and announced to assist a financial establishment of indoor smoking room. in the indoor public space before giving an advice to the firm. to provide a separate room for smokers. smoking room inside. The new law justified the legal concept of separating the public space into the non-smoking and smoking. 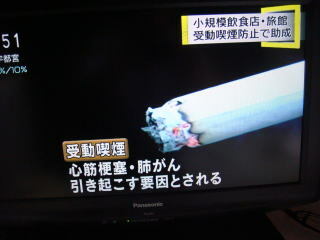 The TV commercials by Japan Tobacco Inc. promoting an installation of the space for smokers are remaining in force. 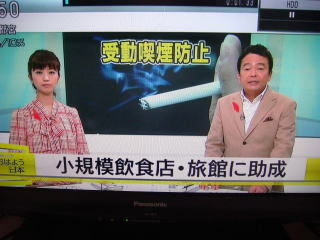 Sadly, Japan is now becoming an ideal country for a tobacco company. into the non-smoking and smoking to protect a worker. (L) Government will give a financial support for setting up a smoking space. (M) An inhalation of tobacco-smoke from others will be the trigger to cause a heart attack and lung cancer. should be free from the hazard derived from cigarette smoke. in restaurants/bars and Ryakan (hotel). should be the number of employee is under 100. The maximum assistant payment is 2,000,000 yen. 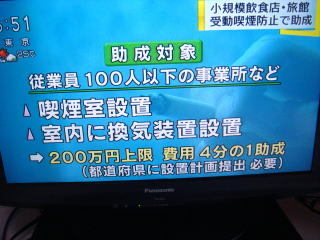 Source: NHK News October1, 2011.
support rate from the present 25% to 50% of the whole construction fee in 2013. 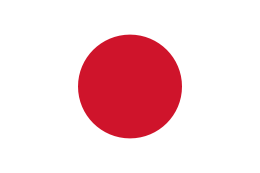 Japan is a country which officially ratified the treaty by the Framework Convention on Tobacco Control. the newly constructed smoking room inside of the restaurants and hotels. 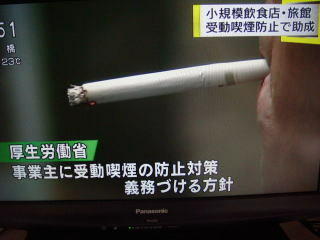 Prefecture ordinance approved a separate smoking booth in a food industry and hotel. decision of the Government to increase a financial aid to constructing the definitely noxious smoking room. Department of Health, Labor and Welfare will grants to the applicants for a construction of indoor smoking room. 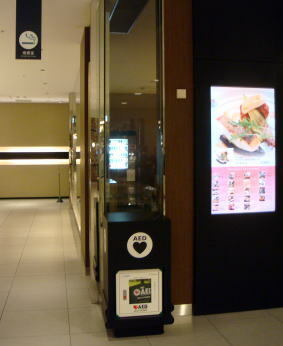 AED ( automated external defibrillator ) is placed at the smoking booth on a restaurant-floor of a department store in Tokyo. 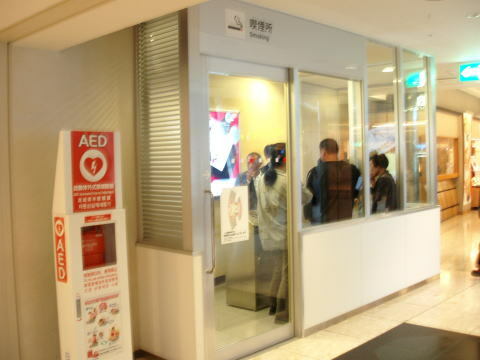 AED stands in a smoking room of the major airport in Hokkaido. limited to schools, hospitals, department stores, government buildings and some other public places. smoking rooms apart from non-smoking section. The grand mistake of the policy of Kanagawa Pref. is to abandon a total carpet smoking ban and to create a separate smoking room for smokers. with full of toxic smoke. This is definitely against the purpose of the indoor clean-air act: anti-smoking law. only considers a health of the users of restaurants, bar, pachinko parlors and other public places. This comment was written by Junhaku Miyamoto, MD., PhD, in April 2009. 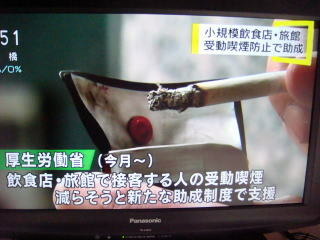 Herald Tribune International Japan must move faster on anti-smoking laws. After he played a regime, he introduced the 25% financial assistance to make a smoking room in a building. Of course, this is not the reason, but he finally resulted that he fell from power after 2013 election. the adverse outcome of the local ordinance. to working in that section at food industries. of the building. They lectured that nobody should be worked in a toxic smoking area. 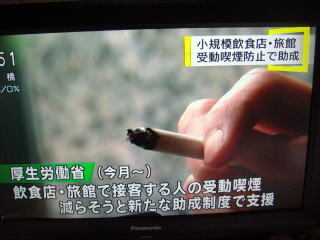 Dr. Miyamoto stressed that smoking ban should be applied to a restaurant, bar and pub at the different stages. He advised the content of a total smoking ban should be simple and clear, excluding numerous exceptions. Russia enforced a total smoking ban in public indoor space in June 2014. The article was written in August 2011, and revised in May 2013 and October 2014. Information on new Japanese Government policy was added in January 2017.